It was a chronic condition. Dead keys, they said, and the prognosis was bleak. More than 50 years of occasional aggressive banging coupled with normal wear and tear had made Baldwin mute. His hammers were dull and worn. When they hit the strings, he uttered no sound. The recommended treatment — a complete hammer replacement — could run his caregivers around $4,000 at the very least. They didn’t have that kind of money. And so Baldwin sat in the corner of the William Pitt Union lower lounge trying to remember how or when he got there. The days blurred together as he watched the sun rise and fall from the long windows encasing the room. An anonymous donor came forward and snapped Baldwin from his stupor. There was a glimmer of hope. The woman couldn’t bear to see Baldwin sitting there, neglected, day in and day out. After all, she thought, what good is a piano that can’t be played? She gave a hearty chunk of change to Pitt Arts, a division of Student Affairs that offers students affordable access to the arts. It was her vision that one day, not only would Baldwin regain function and mobility, but students could play him. The donor entrusted Annabelle Clippinger, the director of Pitt Arts, with his repair. The first repairman sized up Baldwin and brushed him aside. Unfixable, he said. Too old. But Clippinger wasn’t satisfied and sought a second opinion. She found a registered piano technician — a Mr. Michael Mezhinsky trained in Moscow — to do the job. Even with the anonymous donation, there was nowhere near enough money for the needed hammer replacement. But Mezhinsky was a reasonable guy, and he offered a temporary fix — shaving Baldwin’s hammers. It would only run them about $1,000 instead of $4,000 or more. The shaving would extend Baldwin’s life, but at some point, the keys would fail again. Clippinger was determined to make it work. But she still needed more money, even for the shaving. She contacted the donor again to ask if she would consider donating more money. The donor doubled her contribution, and the donation covered the cost of the shaving as well as a lock and cover to keep the piano safe from unauthorized passersby. Mezhinsky worked meticulously to file the faulty hammers. He grasped their wooden ends, reshaping the felt casing on each hammer until it regained some semblance of the necessary egg shape. The procedure was risky. Mezhinsky discovered other technicians had filed the hammers over the years, and the hammers’ felt had nearly worn away. But he gave it his best. After filing, he repositioned the hammers and pressed a key. The notched felt made contact with string. Sound broke his silence, and Baldwin was reborn. 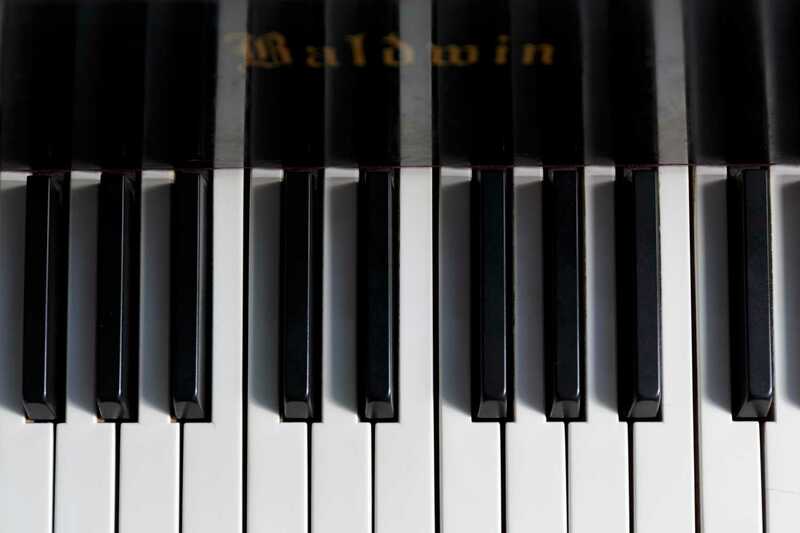 Baldwin had full musical range, a touched-up cabinet, a fabric cover to keep him warm and dust- and scratch-free and a lock to protect his keys from abuse. The Union front desk would unlock Baldwin’s cover for any Pitt student wishing to play him. But Baldwin found himself sitting for long stints at a time with no visitors. It was the damn Yamaha in the Union Jazz Hall, every time. Students frequently picked the cheaper Japanese upright over Baldwin, an American-made grand. Some claimed the sound of the Yamaha was brighter. Others desired an audience, and the Jazz Hall — catty-corner to the lower lounge but closer to the Union’s main entrance — offered a more public location for playing. The sound of the Yamaha’s music tormented Baldwin, and his self-esteem diminished by the day. 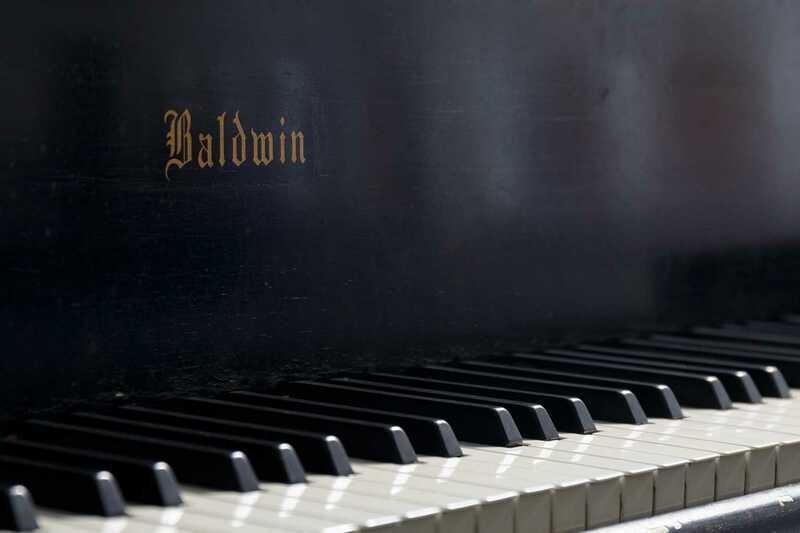 Seemingly, Baldwin was worth more than the Yamaha — while new Baldwin grand pianos cost between $21,000 and $42,000, new Yamaha upright pianos cost between $4,400 and $18,900. Yet Baldwin did not find these numbers comforting. In self-worth, Baldwin was not valuable enough. Baldwin found his only solace in the students that did visit him, and he tried his best to please them with his full sound. But even these students complained. He’s old, one said, and the keys “stick” — failing to bounce back instantaneously. Baldwin wondered how the students could expect him to immediately bounce back after being ignored for so long. Despite the grief they gave him, Baldwin enjoyed the music they made, and the passion with which they passed along to him through their fingers. Sometimes it was neo-soul piano, a mix of R&B and jazz, snappy rhythms with creative chords. Other times it was ACG — anime, comic and games music — the score originating from video games such as the Legend of Zelda. Baldwin took the most pride in the human interactions that piano playing produced. When Yanbo Wang, a GIS master’s student, played ACG music, Baldwin would watch as other students who recognized the songs approached Wang and conversed with him. 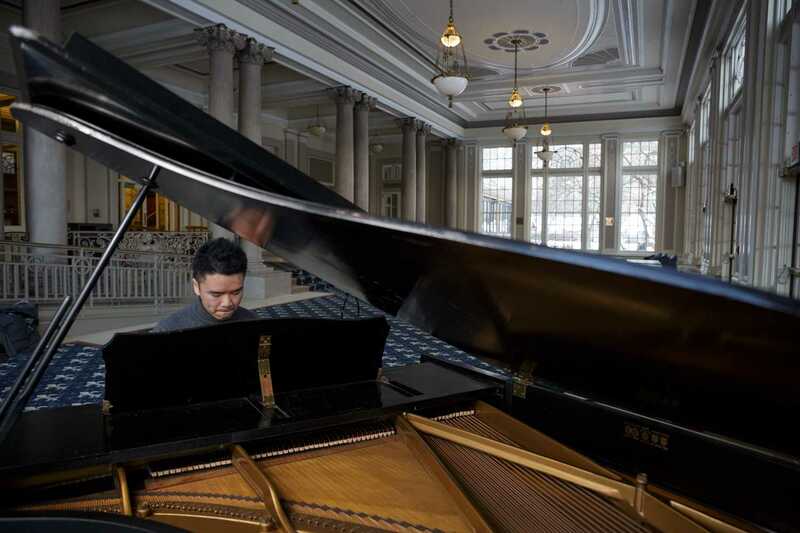 Baldwin, like Wang, was struck by how the piano gave students of different nationalities and backgrounds a reason to get to know each other. Baldwin relished in the emotion that reverberated through his strings, his wooden construction and throughout the room. He tried to learn as much about the outside world from the students as he could. 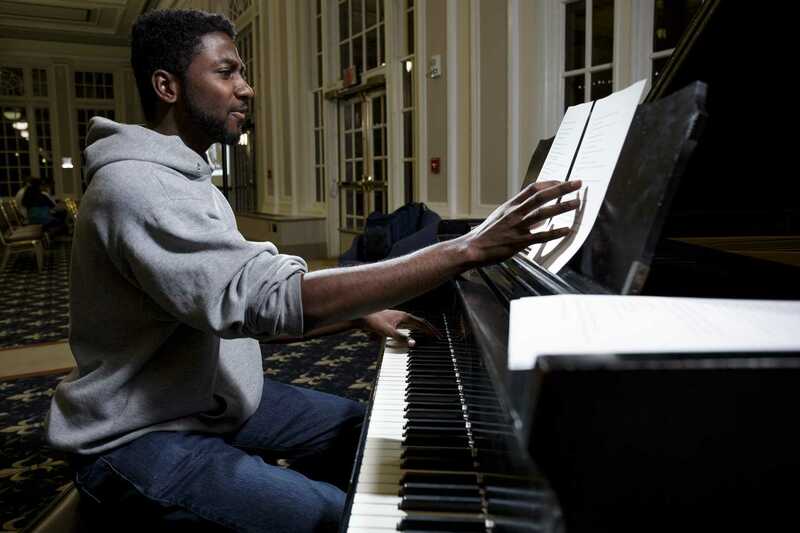 One sophomore, Eric Reynolds, combined spoken word and piano when he played. His hands floated about the keys as he slammed about current events and social issues, addressing topics such as police brutality in his poems. Metaphors representing the Boston bombing as Bigfoot and the fear of growing up as the Muffin Man were difficult for Baldwin to digest, but he savored the words and the music and the feeling. But most of the time, Baldwin still sat alone. Perhaps if others knew his story, he thought, they would play him more. He just wanted people to understand who he was. One day, two girls sauntered into the Union lobby and sat down on the cushioned chairs near the building elevators. Both editors at The Pitt News, they were looking for some sort of inspiration. Music migrated to their ears from the Jazz Hall Yamaha, and an idea dawned on them. They needed a story, and they needed a subject. 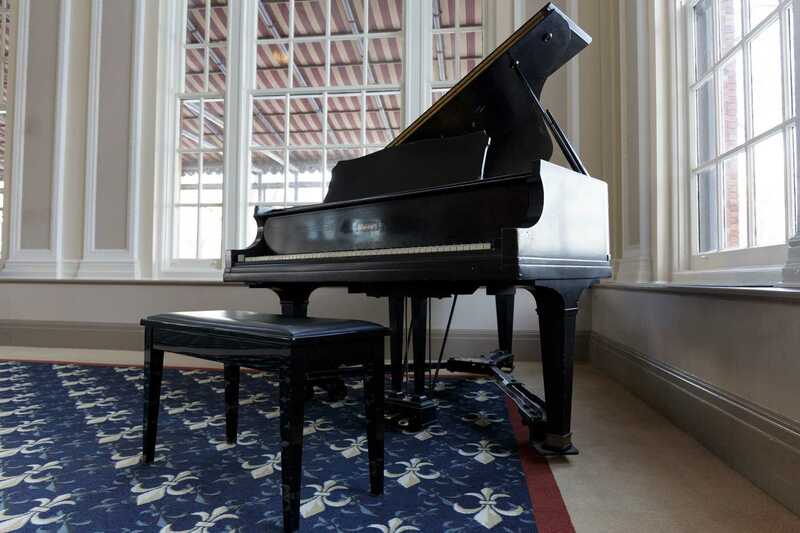 Though inanimate objects had never been chosen for the Silhouette edition before, they decided they would tell the story of the Jazz Hall Yamaha piano. Of course, Baldwin thought, as if the Yamaha didn’t already get enough attention. The girls called their friend — another editor at The Pitt News — explained the idea to her and asked her to write the piece. Slightly distracted at the time and unenthused, the friend agreed. The bouncy, curly-haired girl’s first stop was the Pitt Arts office. She heard the Yamaha piano had an interesting history and was determined to get to the bottom of it. She was led to Clippinger’s office, where she asked about the Yamaha. To her dismay, Clippinger knew very little about the Yamaha piano. The real story, Clippinger said, was Baldwin’s. He had battled all sorts of adversity — dead keys, a major repair — and in the end, he emerged victorious. The girl, conflicted, said she would talk to the editor-in-chief about changing the story’s focus. On one hand, Baldwin had a more complex history. On the other hand, more students played the Yamaha. She took the Union elevator from the Pitt Arts office down to the main floor. She turned the corner, walked through the Jazz Hall, past the Yamaha, and into the lower lounge. Baldwin sat in the corner, quiet as ever, wrapped comfortably in his quilted sleeve. His isolation did not detract from the story, she thought, but rather enhanced it. She empathized with the piano, and to her, he felt human. She realized that his story was the one worth telling. And Baldwin wanted her to tell his story. He asked that she tell it honestly, completely. Intimately. She heard him and promised that she would.